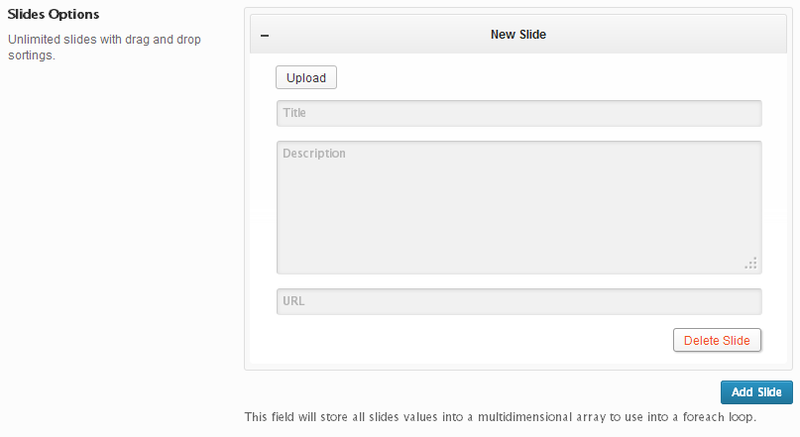 With the Slider field, unlimited slides may be created with titles, descriptions and links. type string ‘slides’ Value identifying the field type. placeholder array Array of placeholder values. See ‘Placeholder Values’ below. title string Placeholder for the title field. description string Placeholder for the description field. sort string Sort number for the slide order. url string Placeholder for the URL field. image string Placeholder for the image text field. thumb string Placeholder for the image select field. attachment_id string Placeholder image in URL format. height string Placeholder height for the preview image. width string Placeholder width for the preview image. This example assumes at least one slide has been filled out and saved, based on the example usage provided above. Individual slide information are stored in a zero-based array. Be sure to change $redux_demo to the value you specified in your opt_name argument. IMPORTANT NOTE: Redux Framework does NOT save blank slides to the database. This means on the initial load of your options panel, the empty slide will not be available. It will be necessary to use isset and !empty checks on the slide variable before attempting to use it in your code, as shown below.